PHOENIX – Washington State's Energy Northwest is preparing to price $592 million of highly rated revenue and refunding bonds to refinance maturities out to a longer time frame and make some capital improvements. The bonds are scheduled to sell via negotiation Tuesday, with JPMorgan and Bank of America Merrill Lynch leading a syndicate that also includes Citi and Wells Fargo Securities. The vast majority of the money will be sold in a tax-exempt Series A. About $7 million of the bonds will be sold in a taxable Series B.
PFM is municipal advisor on the deal, and the law firm of Foster Pepper is bond counsel. The bonds are rated Aa1 by Moody's Investors Service, AA-minus by Fitch Ratings, and AA by S&P Global Ratings. Energy Northwest often executes a large bond sale at around this time of the year. Backing the securities are payments from the Bonneville Power Administration, a federal nonprofit agency based in Oregon. BPA includes two business units, a power service and a transmission service, that combined to generate revenues in excess of $3.4 billion in fiscal year 2016. BPA describes its power service a virtually carbon-free system that markets the power from 31 federally owned hydroelectric projects and several non-federal projects. BPA has revolving authority to borrow up to $7.7 billion from the U.S. Treasury in the form of bonds issued to the federal government, with about $2.9 billion of that authority available as of the end of September 2016. "BPA cannot issue bonds directly to the market, and utilizes other means of non-federal financing," BPA treasury manager Jon M. Dull said in an investor presentation. Non-federal debt, including the Energy Northwest bonds, represents about half of BPA's $8 billion of debt in a total debt portfolio that stands at about $15.6 billion. Payments on BPA's non-federal debt are made before payments to the Treasury. The bonds will be issued pursuant to resolutions for three different Energy Northwest assets. Project 1 is a partially completed nuclear electric generating project located about 160 miles southeast of Seattle. Its construction was canceled in 1994, and ENW has planned for its demolition and restoration and is now maintaining the site to support re-use activities. The Columbia Generating Station is an operational nuclear generator located near Project 1. Operational since 1984, it is the third largest electricity generator in Washington, behind Grand Coulee and Chief Joseph dams. Its 1,190 gross megawatts can power the city of Seattle, and is equivalent to about 10% of the electricity generated in Washington and 4% of all electricity used in the Pacific Northwest, according to ENW. All of its output is provided to BPA. Project 3 is a partially-completed nuclear facility about 70 miles southwest of Seattle in Grays Harbor County that ENW also terminated in 1994. Much of the site was transferred to local public agencies for economic redevelopment. The incomplete Projects 1 and 3 have $1.9 billion of debt and the operating Columbia Generating Station has $3.4 billion. The portion of the 2017 bonds not issued for refinancing purposes and to pay costs of issuance will fund capital improvement needs at the Columbia Generating Station. In rating the bonds, S&P cited strengths such as BPA's status as a federal agency, ongoing federal support, and legislation allowing the agency to defer payments on federal debt if in financial distress. "We assess Bonneville's stand-alone credit profile to be AA-minus and believe there is a moderately high likelihood that the U.S. government would provide extraordinary support to it in financial distress," S&P said. "We base the latter on our opinion of the strong link between the BPA and the federal government, as well as the important federal role the agency plays in the Pacific Northwest. However, after downgrading the U.S. to 'AA-plus' from 'AAA' in August 2011, we no longer view the U.S. government's sovereign credit profile as lifting the ratings of the nonfederal obligations that BPA supports above the utility's stand-alone credit profile." The Energy Northwest bonds are part of BPA's Regional Cooperation Debt program, a program begun in 2014 which BPA says allows it to achieve substantial savings for its regional ratepayers. 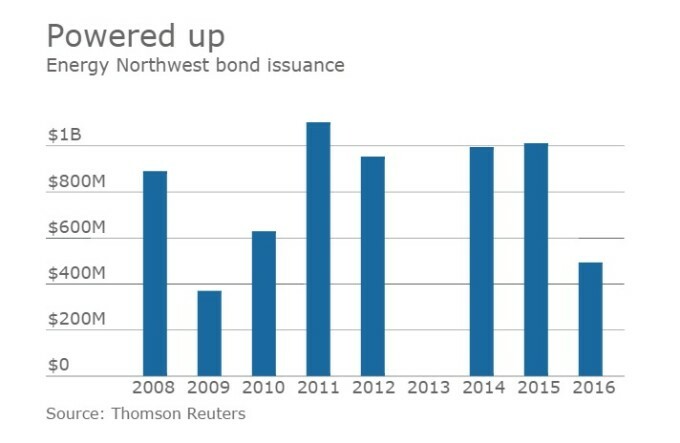 "Under the Regional Cooperation Debt program, Energy Northwest issues refunding bonds to extend maturities which allows BPA to use funds collected in rates to pay off higher interest rate appropriations, creating substantial interest savings," Dull said. "BPA believes that after this transaction, RCD issuances could exceed $2.2 billion." S&P said that the RCD program relies on a number of factors that can be volatile. "The success of the Regional Cooperation debt refinancings and the ability to extend the tenor of BPA's capacity to borrow from Treasury hinge on the economics of refinancing opportunities for reamortizing nonfederal debt, the willingness of ENW to serve as a conduit issuer, and the potential for accelerating portions of Bonneville's federal appropriations and Treasury debt," the rating agency said. The tax-exempt bonds have an optional July 1 2027 call date. The transaction is expected to close May 3.